Place 2 tablespoons olive oil, garlic, onion powder and lemon juice in a large freezer bag and mix. Add chicken and shake to coat. Let marinate in fridge at least one hour or overnight. Remove chicken from marinade and sprinkle with salt and pepper. Grill or saute over medium heat until cooked through and juices run clear, approx. 18-20 minutes, turning halfway. 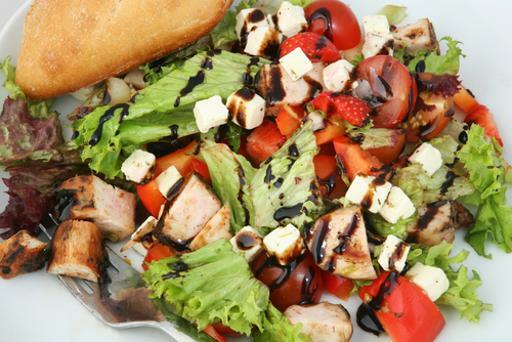 While chicken cooks, whisk together ½ cup olive oil, balsamic vinegar, mustard, honey and salt and pepper to taste. Plate spinach with strawberries, goat cheese and pecans. Once chicken is done, carefully slice into strips or chunks, drape over greens, and add dressing. You can also add other favorite fruits such as mandarin oranges, grilled pears or even blueberries.